When a recipe calls for broth, you'll usually see me use my homemade broth: beef or chicken. I've blogged my experience making beef broth and today I'll finish up my broth posts with chicken broth. As you read in my beef broth recipe, a well made broth will gel. This also applies to chicken broth. I'm warning you now, if you are easily grossed out, you may want to turn away now, but I hope for the sake of healthy broth, you'll continue to read. I again turn to Sally Fallon for my recipe which can be found here. Start with some nice normal aesthetically pleasing vegetables. 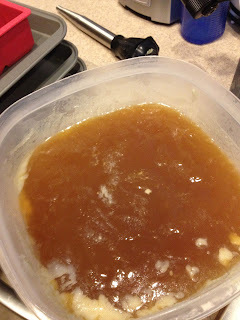 As with the beef broth, when I started making my broth by ignoring the "optional" ingredients, specifically chicken feet, and while my broth tasted far better than any store bought broth I'd had in the past, it did not gel. While at the Asian Grocery looking for beef feet, I saw that they also had chicken feet, so I decided it was time to get past the ick factor. They weren't expensive. Three bucks got me all of these feet! Ok. I cannot say that's not a bit gross. I posted that picture on my facebook and got quite a response- I'd say more responses for that picture than I get in birthday wishes. Chicken feet get people worked up! 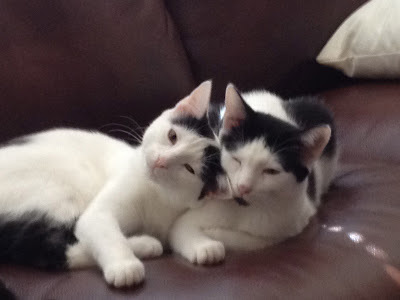 Paleo Kitties Liesel and Dottie don't mind chicken feet. I found this great website that details the preparation that chicken feet need. Luckily, the feet I purchased were already peeled, but I had to remove the talons. I took out my sharp kitchen sheers and snipped them all off. Yes, just keep looking at the cute kitties. Remember, you're not going to eat the feet, just the nutrients they will leave in your broth. 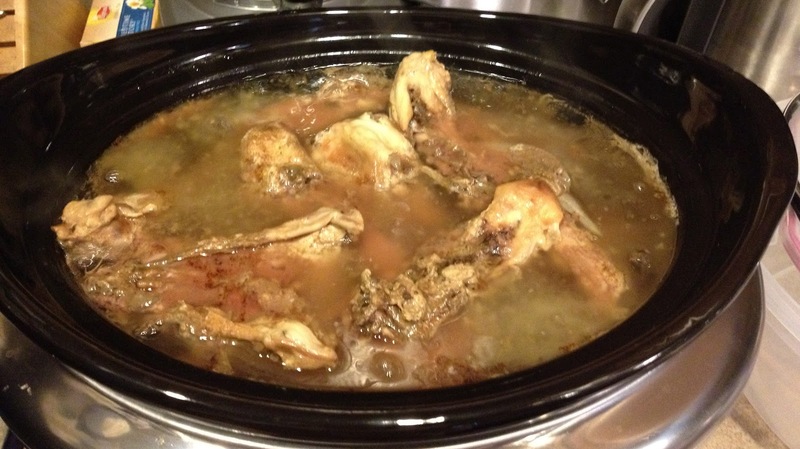 By the time you've simmered your broth for 24 hours, the bones have pretty much fallen apart. I threw those feet into the bottom of my crock pot and covered them with chicken backs I had purchased from whole foods and let it soak with vinegar and water for an hour. I added my vegetables, and let it all simmer in my crock pot for 24 hours. Broth simply isn't pretty while its cooking. I then strained the broth through my wire sieve and refrigerated the broth over night. I was so happy to discover this beautiful gelled broth in the morning. Pretty gelled broth with a little more fat to skim. As with the beef broth, I poured the gelled broth into my silicone muffin "tins" and ice cube trays to freeze in nice portion sizes for easy defrosting later. The Paleo Review: Thumbs Up! 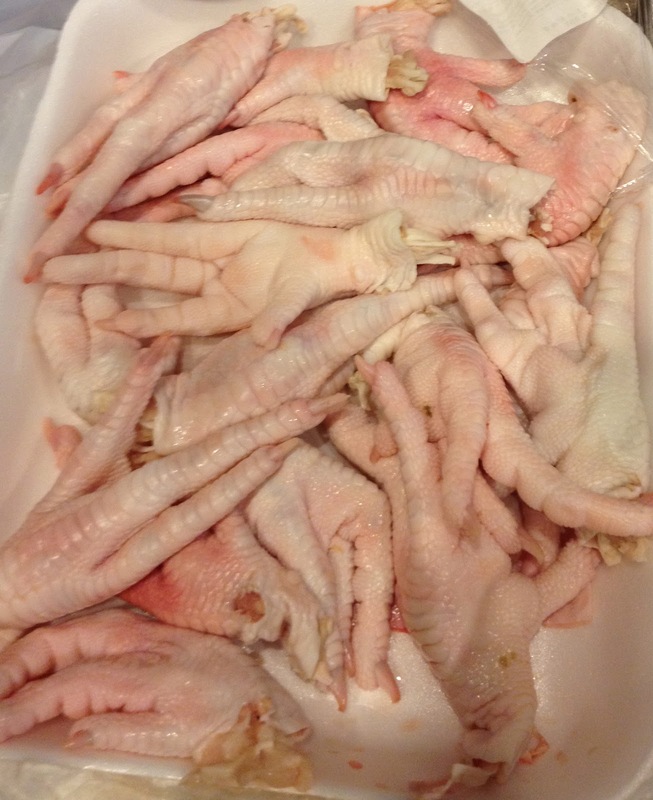 Chicken feet do look gross, but I cannot argue with the results they give in chicken broth. Try it and you will not be disappointed. If you can't get over the ick factor, just don't use the feet but still make your own broth.